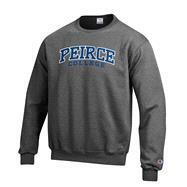 50% Cotton/50% Polyester, crewneck sweatshirt in granite heather; Featuring Peirce College across the center chest. 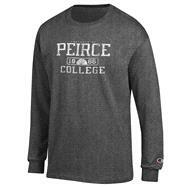 100% Cotton jersey long sleeve t-shirt; Featuring 'Property of Peirce College' with founding date in white. 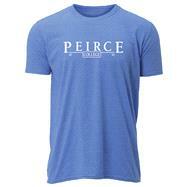 100% Cotton, jersey short sleeve t-shirt with Peirce College design. 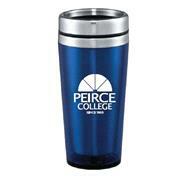 16 oz., double walled stainless steel travel tumbler with a slide lock lid. 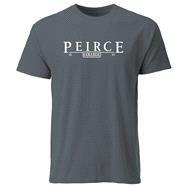 100% Combed Cotton, jersey v-neck t-shirt with ladies relaxed fit; Features Peirce College in the center chest. 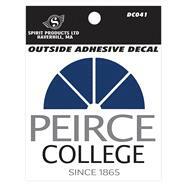 65% Polyester/35% Cotton, short sleeve t-shirt with Peirce College design in the center.